Triumph has added yet another model to its Modern Classics range by taking the wraps off the new Speed Twin. The new bike pays homage to the 1938 Triumph Speed Twin which was known for its performance and handling. In fact, Triumph claimed the first Speed Twin was the first real ‘riders bike’ ever. The new Speed Twin tries to keep alive the sporty traditions with a performance-oriented mechanical setup and mean roadster looks. Those who are familiar with how the Bonneville T120 looks will tell you that the Speed Twin seems to be more aggressive in its appeal than the laidback British roadster. With a healthy dosage of the colour black, the bike gets a dark muscular vibe. Even though the round fuel tank looks quite similar to the T120’s, the dual tone treatment makes the motorcycle look meaner. Triumph’s typical attention to detail has found its way on to the Speed Twin as well as it gets few elements which lend it a premium look. Brushed aluminium finish is found on the mudguards, throttle body covers, side panel finishers, heel plates and headers, while the aluminium 7-spoke alloy rims have been blackened out. The Monza fuel filler cap and bar-end mirrors are few extra bits that improve the overall styling. Since it’s meant to be a sporty roadster, the engineers at Hinckley used the Thruxton R as inspiration and not the Bonnie T120. The double cradle frame is a tweaked unit from the cafe racer with small changes to the steering geometry. It gets a tapered handlebar, a new upper yoke and risers to give it a more comfortable riding stance than the Thruxton R. That said, it is fairly visible from the photos that there will be a bit of forward lean to get to the bars. A sporty chassis and a sporty parallel-twin motor were the identity of the 1938 Speed Twin and this one is no different. 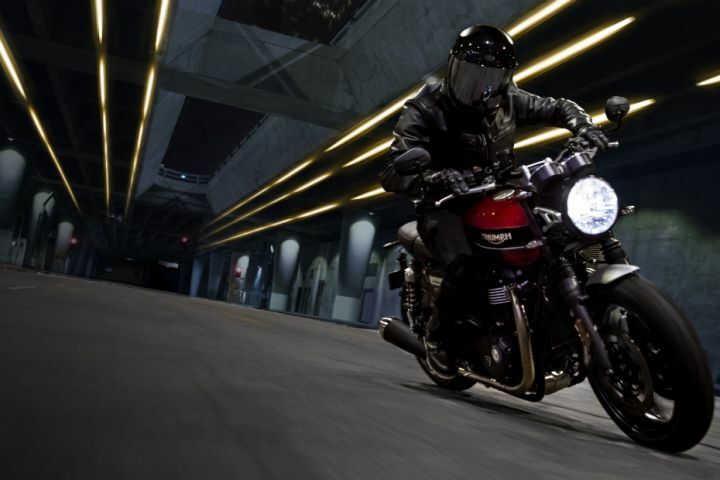 The 1200cc High Power parallel-twin motor from the Thruxton R makes sure that this one too is properly sporty. It makes the same 97PS and 112Nm as the Thruxton R. However, the one found on this bike is 2.5kg lighter. That’s due to the use of a new magnesium cam cover, a revised clutch assembly and new mass optimised engine covers. Twin upswept silencers are sure to provide a soulful and deep rumble that’s associated with British parallel-twins. In terms of electronics, the Speed Twin gets a whole host of aids from the Thruxton R. Ride-by-wire, three riding modes (Sport, Road and Rain), switchable traction control and torque-assist clutch are the elements that it retains. What it does miss out on though, is switchable ABS. The suspension components are not the same ones that you would find on the Thruxton R but rather on the base Thruxton. Thus, you get KYB 41mm cartridge forks and twin preload adjustable shocks, with 120mm of travel available at both ends. It does get better front brakes than the Thruxton though as for the first time you get Brembo four-piston axial callipers acting on twin 305mm discs. The rear 220mm disc with Nissin twin-piston floating calliper is the same. Pirelli Rosso Corsa 3 rubber makes sure that the Speed Twin will not be found lacking when it comes to gripping the road. Triumph India has confirmed that they will be getting six bikes to India in 2019, with the Speed Twin being one of them. The bikes goes on sale on 18 January, 2019 in the UK, so an educated guess would be that we will see this bike make it down to our shores just before the start of the monsoons. It will certainly hold a more premium value than the Bonneville T120 and might just be equally or just slightly higher valued as the Bonneville Bobber, which is priced around the Rs 10 lakh mark.